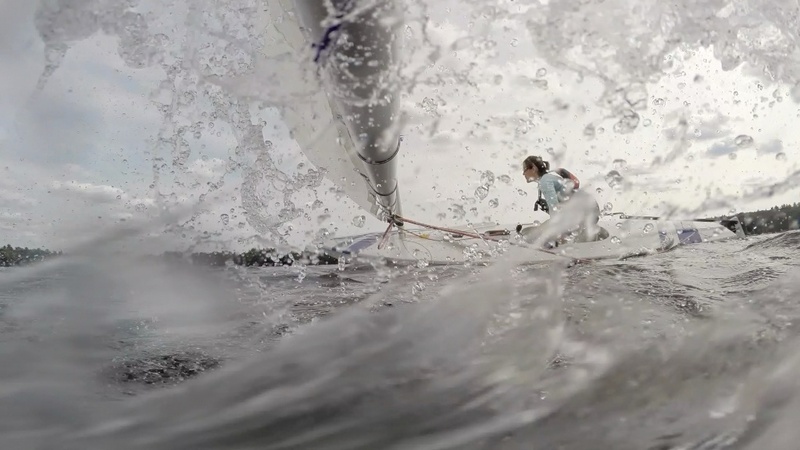 Bernadette Levesque extended her lead in the 2014 Summer Sunfish series today by beating John Houstle in three out of four races in chilly, blustery conditions. Bernadette was able to get better boatspeed, particularly downwind, and outpointed John almost all day, and he said that it took everything that he had to beat her in the third race. Full results are on our Results Page. Next weekend, racing is cancelled as Bernadette and Mark are going to be participating in the Yankee Duo, two regattas hosted by different clubs at the same venue on Cape Cod. Great photography. But what type of camera and lens you are using? This is a screen grab from a GoPro Hero 3+ Black. Set to capture video at 2.7k, which effectively makes each frame into an almost 4 megapixel still.